It’s Sacha’s birthday, but he’s in no mood for celebrating as he awaits Daniel’s test results, while Chrissie tries to maintain a brave face, knowing that she faces a difficult decision if her son is a match for Rachel. Michael plans to devote the day to his daughter Jasmine, who is due to arrive from America, but his good intentions are challenged when he meets Seb, a teenage cancer patient. 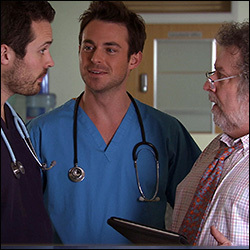 Elsewhere, an unusual case from AAU forces Harry and Ollie to work together.